It is difficult at this distance to comprehend the range of emotions engendered when the shooting stopped at 11.00am on 11th November 1918. While thousands were celebrating in the streets others mourned; relief and joy were matched by despair and loneliness. 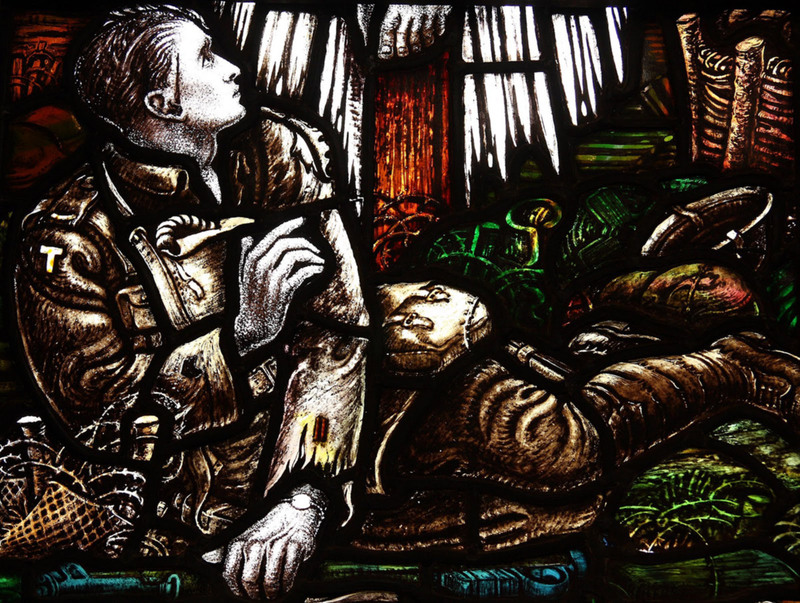 The central section of the memorial window in Bradford Cathedral dedicated to the 6th Battalion West Yorkshire Regiment. 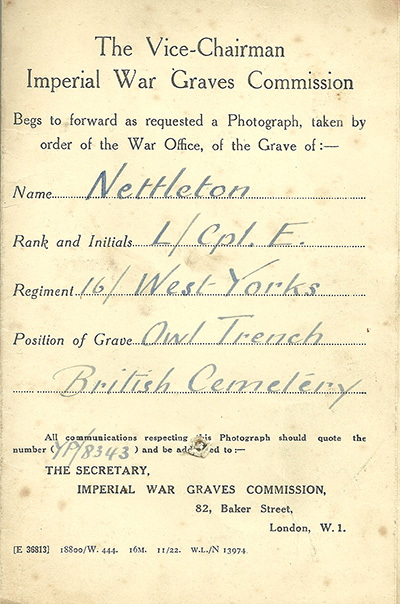 These documents from the family of LCpl Ernest Nettleton illustrate a small part of the scale of the administrative task undertaken by the War Graves Commission. 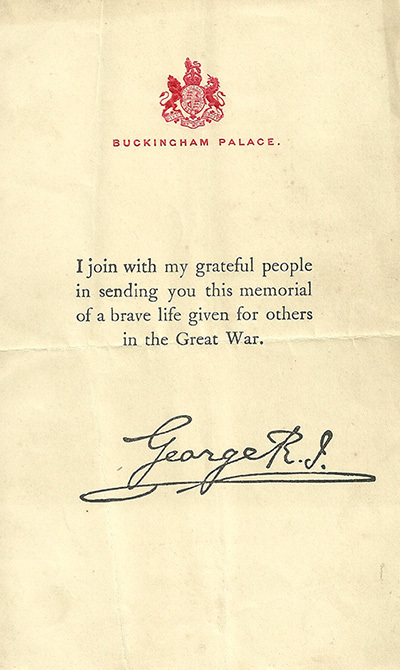 Over 900,000 men of the British Army died in the Great War. Outside the YMCA in Forster Square people had flocked to an open- air celebration and a brass band led the singing of popular hymns. There were services of Thanksgiving in Bradford Cathedral and at Eastbrook Hall the Hallelujah Chorus was sung. The minister warned the next job would be to feed the German people: “the conscience of the world would not let them starve”. Too old to serve in the army Fabian Ware, a former Bradford school teacher, worked with the Red Cross in France from September 1914. 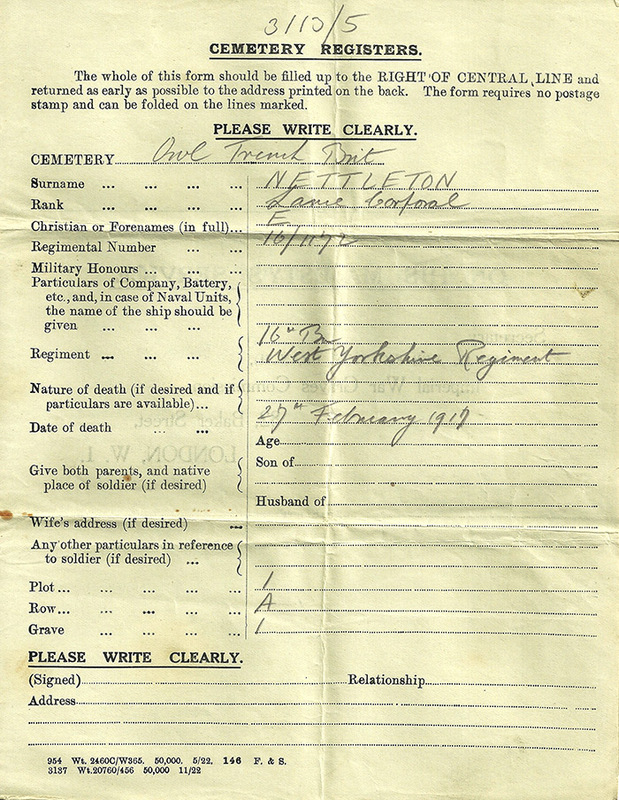 He soon realised the pressing need to mark and record graves and he set up the Graves Registration Committee. In 1915 the task was transferred to the Army but Fabian Ware continued to lead the organisation which in 1917 became the Imperial (later the Commonwealth) War Graves Commission. Ware’s vision was that every serviceman, irrespective of rank, race or creed, would have his own grave with identical headstone in a setting reminiscent of an English Garden. He obtained formal agreements with overseas governments to ensure the graveyards could be managed by the Commission in perpetuity. 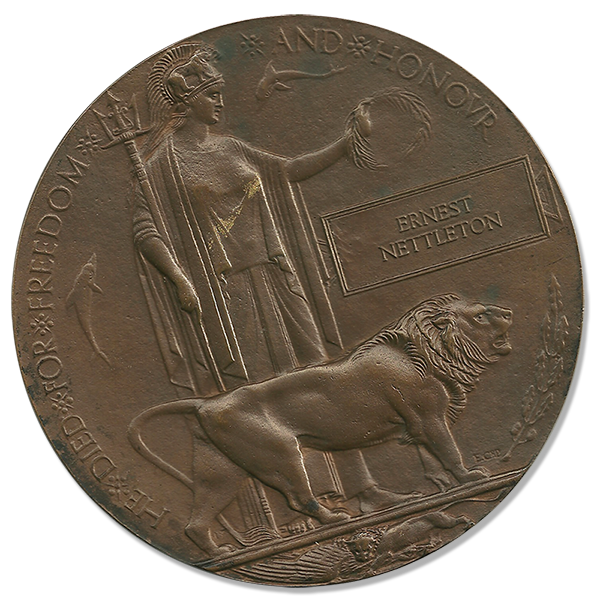 Captain Tempest, writing in his history of the 6th Battalion in 1921, remembered 1915 to 1918 as “a succession of sordid, nerve-racking and perilous experiences . . . human endurance was tried to the uppermost . . .” The memorial window in Bradford Cathedral, designed by Archibald J. Davis of Bromsgrove in 1921, movingly reflects these sentiments. The image above shows an Infantryman lying mortally wounded amidst the desolation of the battlefield. The whole window rewards careful study. In the early 1920s memorials were unveiled across the Bradford District. The Cenotaph in the centre of Bradford was dedicated on 1 July 1922, the sixth anniversary of the Battle of the Somme in which the Bradford Pals and Territorials had suffered so greatly. The rawness of people’s loss did not diminish. In 1925 the Telegraph and Argus reported poignantly and vividly ‘weeping mothers, their hands clasped in those of fatherless little children, laid flowers in this sacred place in memory of loved husbands; aged couples sorrowfully mounted the steps, their hearts aching with poignant yet proud remembrance of their heroic sons’. Fabian Ware (1869 – 1949). 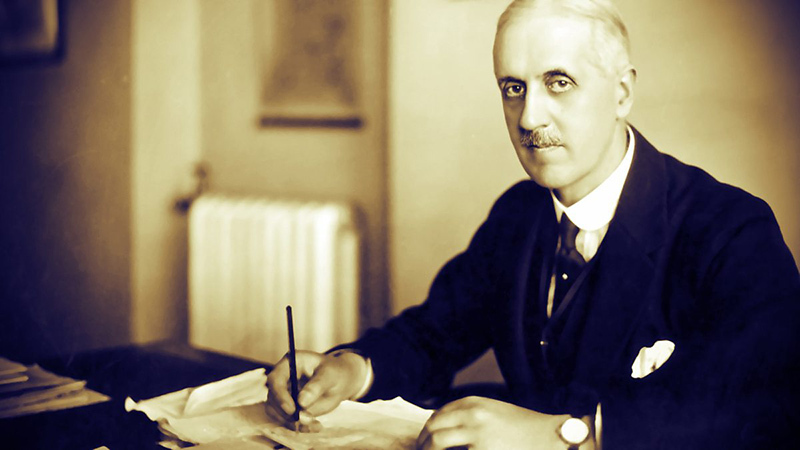 The Imperial War Graves Commission became his life’s work. 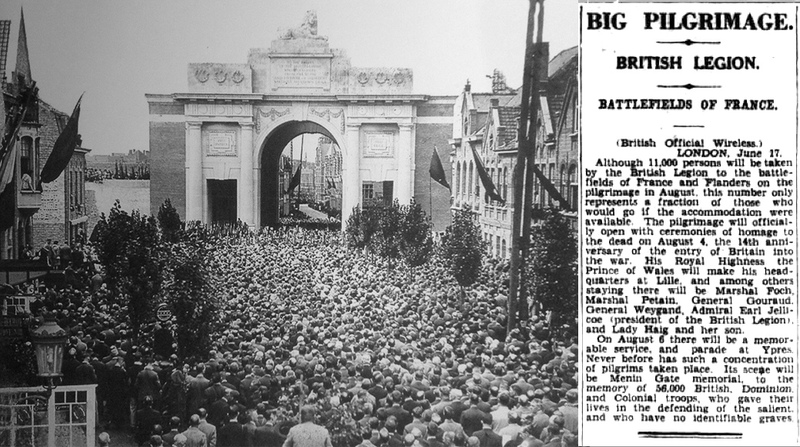 The Brisbane Courier, June 1928, gives advance notice of the Royal British Legion pilgrimage to the Menin Gate. Ex-servicemen from Bradford, remembering fallen comrades, were amongst 11,000 members of the British Legion who made a pilgrimage to Ypres In 1928. Dedicated the previous year, the Menin Gate commemorates 54,389 British and Commonwealth troops with no known grave who died before 15 August 1917. The memorials at Eccleshill, Allerton and Greengates are the work of Harold Brownsword RCA (1885 – 1961). He taught modelling at Regent Street Poly and later became its Principal. The Bradford Cenotaph, pictured here at the dedication, was designed by the City Architect Walter Williamson and used stone quarried from Bolton Woods.